Does Congress intend to investigate the operation? Do the three presidential candidates—Democrats Hillary Clinton and Barack Obama, and Republican John McCain, have any comments (see April 28, 2008)? Since the law expressly forbids the US government to, in reporter David Barstow’s words, “direct psychological operations or propaganda against the American people,” do Constitutional attorneys and scholars have any opinions on the matter? Was the operation a violation of the law? Of ethics? Of neither? Former Secretary of Defense Donald Rumsfeld created the Office of Strategic Influence in 2001 (see Shortly after September 11, 2001), which was nothing less than an international propaganda operation. Rumsfeld claimed the office had been closed down after the media lambasted it, but later said the program had continued under a different name (see February 20, 2002). Does the OSI indeed still exist? PBS reports on the recent revelations about a Pentagon propaganda operation that uses retired military officers as “independent military analysts” to further its goal of promoting the Iraq war and occupation (see April 20, 2008 and Early 2002 and Beyond). Reporter Judy Woodruff notes, “And for the record, we invited Fox News, CNN, MSNBC, CBS, ABC and NBC to participate, but they declined our offer or did not respond.” Neither does the Pentagon send anyone to take part in the report. Woodruff discloses that PBS’s NewsHour with Jim Lehrer put five military analysts on retainer in 2003, but says that none of them attended Pentagon briefings while being paid by PBS, as so many of the other network analysts did. Former Pentagon spokesman Larry Di Rita denies that the Pentagon’s Iraq propaganda operation recently exposed in the New York Times (see April 20, 2008 and Early 2002 and Beyond) ever excluded critics of the Pentagon. Di Rita is proven wrong by the Pentagon’s own documents concerning the operation (see May 9, 2008). 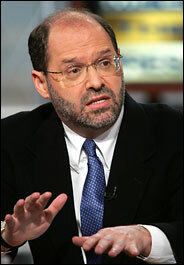 Moreover, one of those military analysts, Fox News’s William Cowan, was fired in 2005 for criticizing the US’s progress in Iraq (see August 3-4, 2005). No Recollection - In an e-mail exchange with Salon columnist Glenn Greenwald, Di Rita claims, “I simply don’t have any recollection of trying to restrict [Cowan] or others from exposure to what was going on.” Di Rita cites two supporting sources, fellow analyst Barry McCaffrey and McClatchy war correspondent Joseph Galloway, as examples of the Pentagon “reaching out to people who specifically disagreed with us.” Three days later, Galloway responds in his own e-mail to Greenwald, and disputes Di Rita’s veracity. Bill Moyers, John Walcott, Jonathan Landay, and Greg Mitchell on PBS’s ‘Journal.’ [Source: PBS]In his regular “Journal” broadcast, PBS political commentator Bill Moyers focuses on the role of the media in the run-up to the invasion of Iraq. “America was deceived, with the media’s help,” Moyers declares, and interviews three media figures to help explain how: John Walcott, Washington bureau chief of McClatchy News; Jonathan Landay, one of Walcott’s “ace reporters;” and Greg Mitchell of Editor & Publisher, “known to many of us as the watchdog’s watchdog.” Part of the discussion focuses on the failure of most media reporters and broadcasters to question the Bush administration’s assertions about the Iraq war. Landay says, “I was just I was left breathless by some of the things that I heard where you heard correspondents say, ‘Well, we did ask the tough questions. We asked them to the White House spokesmen,’ Scott McClellan and others. And you say to yourself, ‘And you expected to get real answers? You expected them to say from the White House podium—“Yeah, well, there were disagreements over the intelligence, but we ignored them”’ when the President made his speeches and the Vice President made his speeches. No, I don’t think so.” Mitchell agrees, noting that ABC reporter Charles Gibson said that we “wouldn’t ask any different questions.” Mitchell says he found Gibson’s remarks “shocking.” Mitchell continues: “[T]hat someone would say we would even with the chance to relive this experience and so much we got wrong—going to war is—which is still going on over five years later, all the lost lives, all the financial costs of that. And then to look back at this, you know, this terrible episode in history of American journalism and say that if I could do it all over again, I’m not sure we would ask any different questions.” Walcott takes a different tack, saying that reporters “may have asked all the right questions. The trouble is they asked all the wrong people.” Landay notes that “you have to take the time to find those people,” and Mitchell adds that when you do find real information, “[y]ou can’t bury it.” Landay adds that some powerful, public admission of error and self-examination might go far to counter the perception that the media is just as untrustworthy as the government. The Senate Armed Services Committee releases a classified 261-page report on the use of “harsh” or “enhanced interrogation techniques”—torture—against suspected terrorists by the US. 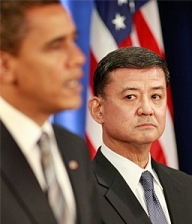 The conclusion of the report will be released in April 2009 (see April 21, 2009). The report will become known as the “Levin Report” after committee chairman Carl Levin (D-MI). Though the report itself is classified, the committee releases the executive summary to the public. Top Bush Officials Responsible for Torture - One of the report’s findings is that top Bush administration officials, and not a “few bad apples,” as many of that administration’s officials have claimed, are responsible for the use of torture against detainees in Guantanamo, Afghanistan, Iraq, and elsewhere. Began Shortly after 9/11 - The report finds that US officials began preparing to use “enhanced interrogation” techniques just a few months after the 9/11 attacks, and well before Justice Department memos declared such practices legal. 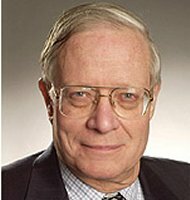 The program used techniques practiced in a US military program called Survival, Evasion, Resistance, and Escape (SERE—see December 2001), which trains US military personnel to resist questioning by foes who do not follow international bans on torture. As part of SERE training, soldiers are stripped naked, slapped, and waterboarded, among other techniques. These techniques were “reverse-engineered” and used against prisoners in US custody. Other techniques used against prisoners included “religious disgrace” and “invasion of space by a female.” At least one suspected terrorist was forced “to bark and perform dog tricks” while another was “forced to wear a dog collar and perform dog tricks” in a bid to break down their resistance. The CIA thought al-Qaeda operative Abu Zubaida was withholding information about an imminent threat as early as April 2002 (see March 28-August 1, 2002), but did not receive authorization to torture him until three months later. Some Senate Intelligence Committee members were briefed on the torture of Zubaida and 9/11 plotter Khalid Shaikh Mohammed in 2002 and 2003. CIA Director George Tenet, in the spring of 2003, asked for a reaffirmation of the legality of torture methods (perhaps this memo—see June 1, 2003). Cheney, Rice, then-Attorney General John Ashcroft, and then-White House counsel Alberto Gonzales were among the participants at a meeting where it was decided that the torture policies would continue. Rumsfeld and Powell were not present. 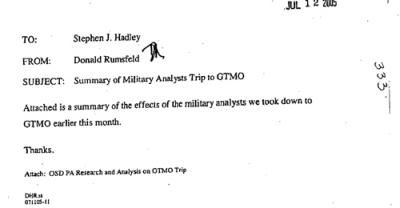 The CIA briefed Rumsfeld and Powell on interrogation techniques in September 2003. Administration officials had lasting concerns about the legality of waterboarding as they continued to justify its legitimacy. 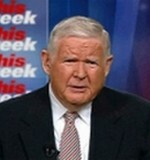 Reactions among other senators is divided, with John McCain (R-AZ), Lindsey Graham (R-SC), and Joseph Lieberman (I-CT) asking Obama not to prosecute Bush officials who authorized or gave advice concerning torture, and Senate Judiciary Committee chairman Patrick Leahy (D-VT) reiterating his support for an independent “truth commission” to investigate the interrogations. [McClatchy News, 4/22/2009; Senate Intelligence Committee, 4/22/2009 ] In 2008, Bush admitted approving of his administration’s authorization of torture (see April 11, 2008). Tom Ridge and Rachel Maddow. 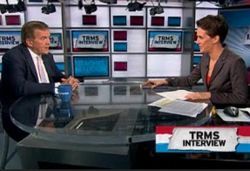 [Source: Armchair Generalist]Former Homeland Security head Tom Ridge is interviewed by progressive television host Rachel Maddow. Ridge has authored a book, The Test of Our Times, a memoir of his tenure in the Department of Homeland Security (DHS) from October 2001 through the end of President Bush’s first term. Maddow notes that 22 federal agencies were incorporated under the leadership of DHS, from the Federal Emergency Management Agency (FEMA) and the Border Patrol to the Coast Guard and the Secret Service, “the biggest change in what we pay federal tax dollars for since we got a unified Defense Department in 1947.” She goes on to note that one of the new agency’s biggest failures was its lackadaisical and incompetent response to 2005’s Hurricane Katrina, though the Coast Guard, one of DHS’s daughter agencies, did eventually deliver what she calls “belated but frankly relatively competent aid,” and Ridge was not DHS secretary when Katrina struck. Raising the Threat Level - Maddow’s primary focus during much of the interview is the Bush administration’s raising of the so-called “threat level” during 2004, as the presidential elections heated up (see July 8, 2004, for example). In his book, Ridge noted that he wasn’t sure events justified the raising of the threat level. Questions of Conflict of Interest, Ethics - Almost immediately, legal ethicists assert that Virginia Thomas’s role as the head of a partisan, openly political advocacy organization could taint her husband’s impartiality, especially in light of the Citizens United Court decision, in which her husband sided with the 5-4 majority (see January 21, 2010), that allows her group to accept donations and spend them without publicly disclosing information about them. The group could have benefited from the Court’s decision, and Justice Thomas’s decision could be seen as being influenced by his wife’s decision to start the group. Law school professor Lucas A. “Scot” Powe, a Court historian, says, “I think the American public expects the justices to be out of politics.” The expectations for spouses are not so clear, he adds, saying, “I really don’t know because we’ve never seen it.” Legal ethicist Stephen Gillers, another law professor, says, “We expect the justice to make decisions uninfluenced by the political or legal preferences of his or her spouse.” Moreover, the press learns that while the Court was deliberating the Citizens United case, Liberty Central received an anonymous $550,000 donation. Government watchdog organization Common Cause wrote a letter to the Justice Department asking if Justice Thomas should recuse himself from the case, and wrote that “the complete lack of transparency of Liberty Central’s finances makes it difficult to assess the full scope of the ethics issues raised by Ms. Thomas’s role in founding and leading the group.” (The media later learns that $500,000 of the anonymous $550,000 donation for the organization comes from Dallas real estate investor Harlan Crow, who also hosts a fundraising event for the organization at his home. Crow once gave Justice Thomas a $19,000 “Frederick Douglass Bible” as a gift, and donated $150,000 to build a new wing named for Justice Thomas on a Savannah, Georgia, library that he visited frequently in his youth.) Common Cause also notes that Justice Thomas had failed to report on his financial disclosure filings his wife’s income over the last 13 years, prompting him to file amendments to the filings that indicated the sources, but not the amounts, of his wife’s income. Justice Thomas refuses to recuse himself from the case. Osama bin Laden’s killing by US forces on May 2, 2011 (see May 2, 2011) reignites the debate about the usefulness of the torture techniques used by US intelligence. The debate centers on how US intelligence learned about bin Laden’s location and whether the torture of prisoners helped find him. Courier Provides the Key Lead - According to Obama administration officials, bin Laden was located through US intelligence agencies’ “patient and detailed intelligence analysis” of “a mosaic of sources,” including evidence garnered from detained inmates at Guantanamo Bay. The first clue to bin Laden’s whereabouts came when US intelligence learned of an al-Qaeda courier that worked with bin Laden, Ibrahim Saeed Ahmed, who used the pseudonym “Abu Ahmed al-Kuwaiti.” Ahmed is one of those killed during the Abbottabad raid. US intelligence had known of Ahmed since 2002, after a Kuwaiti detainee told interrogators about him, and it has taken this long for CIA and other intelligence officers to identify him, locate him, track his communications, and then follow him to the large and well fortified compound in Abbottabad.